Jason Gibson, a building service supervisor for Facilities Scheduling Services, has been named the 2017 Employee of the Year at the University of Illinois Springfield. He was honored during a reception on January 24, 2018, in the Student Union Ballroom. Before announcing the winner, UIS Vice Chancellor for Academic Affairs and Provost Dennis Papini thanked the eleven Employees of the Month who were nominated. “At the end of this presentation, one person will be recognized and we should all celebrate their example, along with the other members of the university community who enable and support their excellence,” said Papini. 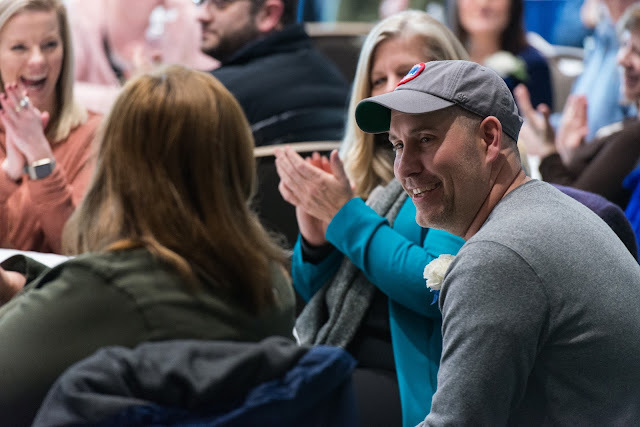 “Jason is not only efficient and timely in his performance, but he is also courteous, helpful and caring towards his fellow employees and UIS students and visitors,” said the nominator. Gibson’s nominators say he always demonstrates a positive attitude at work and is upbeat and truly cares about his work, even on days when he has large furniture moves, such as commencement or taking surplus furniture downtown to the State of Illinois. In accepting the award, Gibson congratulated the other employees who had been nominated for the award and finished with a quote from President Theodore Roosevelt. As Employee of the Year, Gibson will get a check for $500, plus a special parking spot for the entire year.